Save $200 per person with reservation and deposit submitted by Jan. 31st, 2019 ! 10 Days/8 Nights Tour - From $1799 (after early bird discount with deposit by Jan. 31st, 2019)-All Inclusive with Land, Transpacific Air with Tax & Fee and Intercity Transportation. The Super Value China Discovery Tour allows you to travel to China in the most affordable way to experience the popular twin cities of Beijing and Shanghai. In addition to the included tours, many optional excursions are also provided. Today you will take transpacific flight to Beijing China. Meals and snacks will be served on the flight. Movies will also be available. Upon arrival at the Capital International Airport in Beijing, you will be met by our representative and transferred to your hotel. For those arriving in Beijing earlier today, you may spend the rest of the day for leisure or join in the optional tours in Beijing. Today you will visit Tiananmen Square, the Forbidden City, the largest and most intact conglomeration of ancient structures of the imperial palace. This was the palace for 24 Ming and Qing Dynasty emperors who ruled China for over 500 years. Take a photo stop at the National Center for the Performing Arts, also known as the National Grand Theatre, designed by the French architect Paul Andreu. You will also tour the Summer Palace, the famous resort of Empress Dowager Ci Xi. Feast your eyes on the Long Corridor, Longevity Hill, and Kunming Lake. Stop by the Pearl Museum/Factory. Attend a Peking Duck Dinner tonight. Today’s excursion takes you to the Olympic Park where you will view the exterior of the Bird Nest-China National Stadium and Water Cube-China National Aquatic Center. Stop by a Jade Museum/Factory. Later in the day you will visit the astonishing Great Wall of China at Juyongguan Pass, one of the most remarkable feats of mankind. Visit a tea house to learn some Chinese tea culture. Later in the afternoon, enjoy the complimentary foot massage for your relaxation and spend the rest of the evening for leisure. After breakfast, you will visit the UNESCO Cultural Heritage Site - the Temple of Heaven where emperors used to pray for good harvest. You will also attend a morning lesson of Taiji (also referred to as Taichi by the Westerners) exercise on the site of the Temple of Heaven given by a professional. Taichi is a type of internal Chinese martial art practiced for both its defense training and its health benefits. T’ai chi theory and practice evolved in agreement with many Chinese philosophical principles, including those of Taoism and Confucianism. After lunch, you will stop by the Silk Shop and enjoy your free afternoon for shopping or leisure. You may also take an optional tour of Hutong (Chinese alleyways) by riding aboard a rickshaw pedicab through the narrow lanes of the old residential quarters in the afternoon. Attend an an optional Kungfu show in the evening at the additional cost of $40 P/P with admission and transfers. 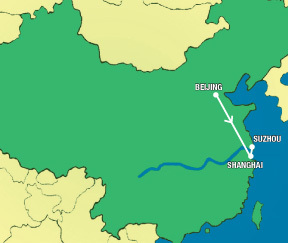 After breakfast, you will take a flight to Shanghai, China’s largest city and home to 20 million people. Often regarded as “the Paris of the East,” Shanghai has retained the flavor of its past European influences. Upon arrival in Shanghai, you will be met by our representative and transferred to your hotel for hotel check in. You will enjoy the rest of the day for leisure, or take an optional tour of Zhujiajiao at the additional cost of $45 P/P. Today you could enjoy your free day for leisure, or take an optional excursion to Suzhou with lunch included. Today you will take a bus or bullet train ride to Suzhou, noted for landscaped classic gardens. You will cruise on the world famous ancient Grand Canal of more than 2400 years history to experience the unique cultures and glimpse the daily life of the local residents. You will also visit the silk embroidery factory, the Master of Fishing Nets Garden and the ancient Panmen Gate, the only existing water & land gate. Take a stroll along the famous Shan Tang Street with a history of more than 1100 years, where you can still experience the past prosperity of Suzhou and its traditional cultures well preserved. Return to Shanghai in late afternoon. Today you could enjoy your free day for leisure, or take an optional excursion to Hangzhou with lunch included. Proclaimed by Marco Polo as "the most beautiful and splendid city in the world", Hangzhou has been well known for its stunning natural and cultural beauty. This morning you will take a bus or bullet train ride to Hangzhou for a full day sightseeing. You will cruise the scenic West Lake, the UNESCO World Cultural Heritage Site, while enjoying the fascinating sceneries around the lake. View the goldfish at Flower Harbour at the West Lake, which is considered one of the top ten scenic attractions of the West Lake. Visit the Pagoda of Six Harmonies, originally built in the year 970 AD. You will also enjoy some time learning the Chinese tea culture at a tea orchard for the famous Longjin tea, which was once granted the status of imperial tea by the emperor in Qing Dynasty. The pan-rasted green tea is produced mostly by hand and renowned for high quality. Return to Shanghai by bus or bullet train in the afternoon.Today you could enjoy your free day for leisure, or take an optional excursion to Suzhou with lunch included. The excursion today takes you to the Bund - a waterfront area that showcases many landmark buildings of western style built in the early 20th century, the bustling Nanjing Road, Chenghuangmiao Old Town, and Tianzifang, an old neighborhood with hidden alleyways full of boutiques and art galleries. You will also visit the well-known Shanghai Museum of Art and History, which ranks among the great museums of the world. Attend a farewell dinner celebration of Shanghai cuisine in the evening, followed by an optional cruise on Huangpu River to enjoy a fascinating night view of Shanghai at the additional cost of $45 P/P with cruise fare and transfers. Take a departure transfer to the airport for flight back home. Transpacific air fare with tax and fee. 8 nights hotel accommodations at five-star deluxe hotels or superior first class hotels. 14 meals: 8 breakfasts, 4 lunches, 2 dinners including Peking duck dinner, and Shanghai cuisine farewell dinner party. The above air inclusive tour fares include both the land services and all international and domestic Chinese air fares along with airlines fuel surcharges, and the government imposed taxes and fees including the September 11 security fee. Additional baggage charges may apply. Reservation with above fares is subject to confirmation. For details about the baggage allowance information, please check www.airchina.us. The above land only tour fares are inclusive of land services along with all intercity air and ground transportation with taxes and fees in China. To enjoy the above air inclusive tour fares, reservation with full payment must be received no less than 90 days prior to departure and reservation is subject to confirmation. Located on the outskirts, Zhujiajiao Water Village has been well known for the well preserved cultures and ancient architectural style buildings. Proclaimed by Marco Polo as "the most beautiful and splendid city in the world", Hangzhou has been well known for its stunning natural and cultural beauty. This morning you will take a bus or bullet train ride to Hangzhou for a full day sightseeing. You will cruise the scenic West Lake, the UNESCO World Cultural Heritage Site, while enjoying the fascinating sceneries around the lake. View the goldfish at Flower Harbour at the West Lake, which is considered one of the top ten scenic attractions of the West Lake. Visit the Pagoda of Six Harmonies, originally built in the year 970 AD. You will also enjoy some time learning the Chinese tea culture at a tea orchard for the famous Longjin tea, which was once granted the status of imperial tea by the emperor in Qing Dynasty. The pan-rasted green tea is produced mostly by hand and renowned for high quality. Return to Shanghai by bus or bullet train in the afternoon.